This Ck Magma Essential Pouch Tool Bag (MA2724) is ideal for Technicians, Electricians and is a safe, handy tool and equipment storage device. 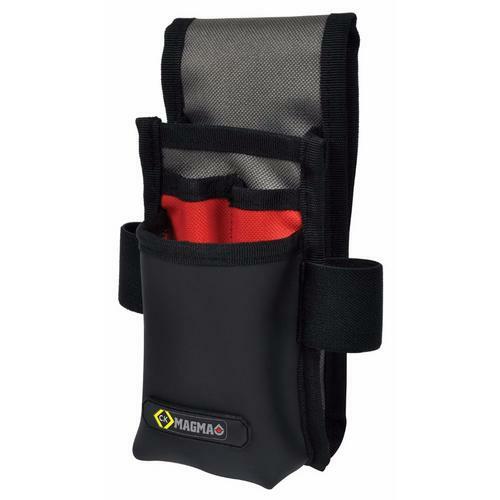 The CK Magma Essential Tool Pouch is constructed to industrial standard and has been designed to keep those vital tools close to hand. With 4 pockets and several additional holders this compact mini pouch accommodates the tools and equipment that you use most. The metal clip to the back of the pouch means it can be quickly attached onto your belt, trousers, tool kits and pockets. Constructed of a durable polyester, this is a mini pouch for essential tools and a must have accessory for any tool bag. “Great product, ideal to handle most minor jobs. I keep my pencils and trimming knife in it so they are always close to hand. what are the dimensions of this pouch? Electrical World Replies: Dimensions for this are H:20cm W:9cm D:10cm.